Background Public sector austerity measures in many high-income countries mean that public health budgets are reducing year on year. To help inform the potential impact of these proposed disinvestments in public health, we set out to determine the return on investment (ROI) from a range of existing public health interventions. Methods We conducted systematic searches on all relevant databases (including MEDLINE; EMBASE; CINAHL; AMED; PubMed, Cochrane and Scopus) to identify studies that calculated a ROI or cost-benefit ratio (CBR) for public health interventions in high-income countries. Results We identified 2957 titles, and included 52 studies. The median ROI for public health interventions was 14.3 to 1, and median CBR was 8.3. The median ROI for all 29 local public health interventions was 4.1 to 1, and median CBR was 10.3. Even larger benefits were reported in 28 studies analysing nationwide public health interventions; the median ROI was 27.2, and median CBR was 17.5. Conclusions This systematic review suggests that local and national public health interventions are highly cost-saving. Cuts to public health budgets in high income countries therefore represent a false economy, and are likely to generate billions of pounds of additional costs to health services and the wider economy. The benefits of population-level public health expenditure—unlike those of personal healthcare and social care expenditure—tend to be long term, mostly accruing after the current politicians and policymakers have moved on. Though large and certain at the population level, benefits are also seen as small and uncertain for individual voters. It is therefore important to take a hard look at the cost-effective evidence, and move towards more rational decision-making in this politically charged area. We conducted a systematic review to examine the ROI of public health interventions delivered in high-income countries with universal healthcare. These included the UK, Western Europe, the USA, Canada, Japan, Australia and New Zealand. The authors used Acheson's definition of public health when considering our search strategy: “The science and art of promoting and protecting health and well-being, preventing ill-health and prolonging life through the organised efforts of society”.5 This definition is purposefully broad and the authors felt that it would incorporate the various fields of public health. We searched the PubMed, MEDLINE, Scopus, CINAHL, Cochrane, PsycInfo and AMED databases using the following search terms: ‘public health’ (all fields) AND ‘return on investment’ OR ‘cost benefit analysis’ (title or abstract). We also hand searched the references of the included analyses to identify any further studies. A grey literature search was completed using Google, yielding three additional results. Limits were set to publications in the English language, and to interventions targeted at humans (where applicable). Studies with poor generalisability to the UK were excluded, including a number from the USA that may poorly reflect UK healthcare systems, structure and demographics. We included studies of any design that reported a ROI of public health interventions delivered in industrialised countries providing universal healthcare. One investigator (RM) performed the initial screening of the titles. A second reviewer (EA) independently reviewed the titles and potentially relevant abstracts. The results were cross-referenced and any disagreements were discussed with a third reviewer (BC). One investigator (RM) led the data extraction and quality assessment, which was then independently duplicated by EA. A third reviewer (BC) adjudicated on any disagreements regarding result details or quality assessment. RM contacted authors for additional data in three cases, with two responses. The methodological quality of each included study was assessed independently by two reviewers (RM and EA) using the National Institute for Health and Care Excellence (NICE) quality appraisal checklist for economic evaluations to assess the quality and external validity of each study.6 Disagreements in methodological quality assessments for all the included studies were resolved by consensus or by recourse to a third member of the review team (BC). We identified 2957 potentially relevant titles, after excluding 2559 duplicates. A further 2816 papers were excluded following title or abstract review. We finally included 52 relevant titles published over four decades (see online supplementary figure S1). Results were stratified by public health specialty (table 1), and by interventions at a local level (table 2) or national level (table 3). Results were reported in five different currencies, as detailed in tables 2 and 3. The median ROI for all public health interventions was 14.3, and the median CBR was 8.3. The reported ROI and CBRs ranged widely. The ROIs ranged from –21.27 (influenza vaccination of healthy workers7) to 221 (lead paint control8). The CBRs reported ranged from 0.66 (20 mph zones in low-impact areas9) to 167 (single measles vaccinations10). Studies reporting ROIs at the extreme end of the spectrum tended to be of poorer quality. Studies reporting a CBR tended to be higher quality. Analysis by specialism revealed that health protection and legislative interventions generally yielded high returns on investment, often being delivered on a national basis and only requiring a one-off intervention (such as a vaccination or a new tax). In contrast, interventions for healthcare public health, health promotion or wider determinants typically had lower returns, being often more complex, resource intensive and sustained. Figure 1 provides overviews of the median, maximum and minimum ROI by specialism, and figure 2 provides an overview of the median, maximum and minimum and CBR values stratified by specialism. Median, maximum and minimum return on investment values stratified by specialism. Median, maximum and minimum cost:benefit ratios stratified by specialism. Eighteen studies reported a large ROI in relation to health protection. The ROI median was 34.2, and ranged from −21.37 to 2218, and the CBR median was 41.8 (range from 1.211 to 16710). Fifteen health promotion interventions were reported, 12 ROI studies and 3 CBR studies. Returns on investment were variable. The median ROI was 2.2 (range 0.712 to 6.213). The median CBR was much higher at 14.4 (range 210 to 29.414). Four studies reported on legislative interventions, with substantial returns. The median ROI was 46.5 (range 3815 to 5515). The median CBR was 5.8 (range 310 to 8.616). Six studies reported ROIs in relation to healthcare public health interventions. The ROI median was 5.1, and ranged from 1.1517 to 19.35.18 No studies reported a CBR. Twelve studies reported a return on wider determinants interventions (for instance, targeted at children or juvenile offenders). The median ROI was 5.6 (range 1.119 to 10.820) with a median CBR of 7.1 (range 0.667 to 23.621). A total of 29 studies reported returns on investment or CBRs in relation to local public health interventions. The median ROI was 4.1, and ranged from −0.922 to 19.3.18 The median CBR was 10.3 (range −0.77 to 23.619). There were 28 studies reporting on national public health interventions. The median ROI was 27.2 and ranged from −21.37 to 221.8 The median CBR was 17.5 (range 1.211 to 1678). First, even with the most rudimentary economic evaluations, it was clear that most public health interventions are substantially cost saving. This confirms our theory that public health interventions generally offer a considerable ROI. Median ROI was generally higher than median CBR in all of our key public health expenditure categories. This was because most studies only report one of these two measures, and studies that report ROI tend to have higher estimates. A direct comparison is possible, by converting between ROI and CBR at the study level using the simple formula ROI=CBR−1. Second, we demonstrated a public health ‘effectiveness hierarchy’. Public health interventions at a local level averaged an impressive ROI of 4, meaning that every pound invested yields a return of £4 plus the original investment back. However, ‘upstream’ interventions delivered on a national scale generally achieve even greater returns on investment, particularly legislation (a 10-fold higher ROI averaging 46). Third, Benjamin Franklin's belief that “an ounce of prevention is worth a pound of cure” is thus borne out by the costs-savings demonstrated, particularly when compared with recent returns for investment in healthcare.23 It has been estimated that investing an additional £13 000 in the English National Health Service (NHS) can achieve health benefits of one additional quality-adjusted life year (QALY).23 When this health benefit is valued in monetary terms at the UK Department of Health's current rate of £60 000 per QALY,24 this represents a ROI of 3.16 (£60 000−£13 000/£13 000). Fourth, this systematic review was partly prompted by recent government cuts to public health budgets in England. We therefore focused on public health interventions delivered in other high-income countries in order to maximise UK relevance. We can therefore now better estimate the likely opportunity costs of the proposed cuts in local and national public health budgets. The median ROI for all public health interventions was 14.3, and the median CBR was 8.3. An ROI of 14.3 implying a cash return of 1430% would sound too good to be true in the financial world. However, public health is different, because decision-making is governed by politics rather than markets. Our systematic review clearly demonstrates that there are big public health investment opportunities out there—they just need some political will to implement them. If we take the lower, conservative CBR figure of 8.3, this would suggest that the opportunity cost of the recent £200 million cuts to public health funding in England is likely to be eightfold higher, in the region of £1.6 billion. The UK government's ‘efficiency savings’ thus represent a false economy which will generate many billions of additional future costs to the ailing NHS and wider UK economy. The recent UK increases in (avoidable) teen pregnancies, sexually transmitted infections, homelessness and suicides are thus predictable and worrying. Do they represent harbingers of worse to come? Although this study draws on the experience of the UK public health system, there are implications for public health systems outside of the UK, which may be guided towards areas of potential underinvestment, and avoid harmful cuts in public health budgets. One paper reported ROI in relation to legislative interventions, which offered substantial returns on investment, with a median ROI of 46.5. Furthermore, they are relatively low cost and target behaviour at a national level. Introducing a sugar sweetened beverage tax could save $55 for every single dollar invested15 in the USA. The 15 studies analysing health promotion interventions reported an overall twofold ROI with a more impressive median CBR of 14.4.10 ,13 ,14 ,22 ,41–51 Interventions aimed at reducing rates of falls are able to show one of the swiftest returns on investment of any of the public health interventions identified within this study, with a CBR of 20.6 returned within 18 months.41 Falls prevention interventions by their nature are relatively low cost (structured exercise programmes for those at risk of falls), and yet their potential impact on demand management for hospital services is clearly demonstrated. Shifting investment from secondary care for the treatment of falls to primary prevention would show significant and swift returns on investment. Tobacco control interventions10 ,42 ,43 overall reported a twofold ROIs, which increased when targeted at high-risk clients such as pregnant women.42 Such contrasting results perhaps highlight the complexity of public health interventions. Twelve studies reported results for wider determinants interventions.9 ,10 ,12 ,19–21 ,56–61 Public health interventions addressing wider determinants also averaged a fivefold ROI. Several studies assessed effectiveness of early years interventions, particularly those targeted at juvenile offenders, or those deemed to be at risk of future offending. Although much of this literature is from the USA20 ,21 ,56 ,57 emerging UK evidence demonstrates similar returns to society and the wider economy.58 The benefits of early years interventions thus extend far beyond health, with participants reporting improvements in literacy, job prospects and earnings (hence savings to the criminal justice system, increased taxation of higher earnings, etc). This also highlights the ‘cross-sector flow problem’: cost-effective public health programmes may not be commissioned if decision-makers are only looking through a narrow health lens. We describe a carefully conducted systematic review. Although the precision of application of ROI calculations varies widely, even the most rudimentary analyses consistently suggest that most public health interventions are substantially cost-saving. Several limitations should be considered. First, the difficulty of defining what constitutes a ‘public health intervention’, particularly those focused on wider determinants. We purposefully cast the net wide to achieve a broad systematic review. Further analysis of particular topic areas might now be beneficial. Second, publication bias appears likely, and even some published studies may have been missed. Such studies are inevitably scattered across a wide field of journals and some economic studies may only be available via organisational websites. However, we did search the grey literature and we did identify almost 3000 total studies—a reassuringly high number. Third, we did not conduct a formal meta-analysis because of the very inconsistent manner in which ROI was calculated, with differing cost perspectives, time horizons and discount rates. Discount rates ranged from 0% to 10%. A high discount rate disadvantages public health interventions that have a long payback time.62 Conversely, a 1 year time horizon may offer too short a time frame. Fourth, the generalisability of the interventions conducted from one country to the next will vary. Participants in US studies may poorly reflect UK demographics and vice versa. Furthermore, some studies focused on vaccination practices that are no longer employed in a number of countries (eg, single measles and haemophilus influenzae type b vaccinations). Similarly, the majority of workplace health promotion initiatives come from the USA, where employers who pay for employees' healthcare will have an additional financial incentive to promote the health of their workforce. Fifth, the quality of the economic evaluations varied considerably. Practice has clearly improved substantially since the 1970s, with recent evaluations employing more sophisticated modelling techniques. Designing such studies can be challenging as public health interventions are often complex and multifactorial, and it can be difficult to isolate an effect size even within a randomised controlled trial. Some of the published literature may therefore systematically overestimate or underestimate the ROI of interventions, and hence the need for more research. There is a clear need for further high-quality economic evaluations of public health interventions, which include a range of discount rates and robust sensitivity analyses. Overall, the results of our systematic review clearly demonstrate that public health interventions are cost-saving, both to health services as well as the wider economy. Furthermore, some are very rapid: falls prevention interventions reported substantial returns within 6–12 months.41 One might reasonably expect equally rapid returns for preventive interventions such as immunisation, healthcare, smoking cessation and nutrition.63 Although attempting to quantify returns within a short timescale can be challenging, even larger returns on investment were seen over a 10–20 years time horizon.10 ,15 ,17 ,32 ,58 This has significant implications for policymakers, who often work to a much shorter time horizon (typically 3–5 years). We suggest that Public Health England, NICE and other advisory bodies therefore need to routinely emphasise that public health interventions can offer surprisingly rapid returns, which may increase further over the longer term. This systematic review suggests that local public health interventions are cost-saving, and offer substantial returns on investment, nationwide programmes even more so. The cuts to public health budgets therefore represent a false economy. They are likely to generate billions of pounds of additional costs to the health services and wider economy. It is well known that it is financially preferable for healthcare systems to aim to prevent ill health rather than to subsequently treat it. A number of studies have calculated the return on investment for individual prevention interventions; however, no systematic review has spanned the breadth of public health. This systematic review demonstrates a median return on investment of public health interventions of ∼14:1. Thus, for every £1 invested in public health, £14 will subsequently be returned to the wider health and social care economy. Furthermore, this review categorises the return on investment according to the public health specialty and local versus national levels of intervention. It suggests that cuts to public health services are short sighted and represent a false economy, with substantial opportunity costs. The authors would like to thank Knowsley Metropolitan Borough Council Public Health Team, and Tracy Owen from the North West Commissioning Support Unit FADE Evidence Knowledge Centre, for their support in the development of this review.
. Public choice analysis of public health priority setting. In: Cuyer A, ed . Encyclopaedia of health economics. Oxford, UK: Elsevier, 2014:184–93 .
. Returns on Investment in Public Health. Canberra: Department of Health and Ageing, 2003.
. Return on investment in needle and syringe programs in Australia: a summary report for the Commonwealth Department of Health and Ageing. Perth: Commonwealth of Australia, 2002. Trust for America's Health. Prevention for a healthier America: investments in disease prevention yield substantial savings, stronger communities. Washington DC: Trust for America, 2008.
. The Economics of Family Planning Services: a report prepared for the Contraceptive Alliance. 1995. London: Family Planning Association.
. What can a pilot congestive heart failure disease management program tell us about likely return on investment? A case study from a program offered to federal employees. Dis Manag 2005;8:346–60.
. Methods for the estimation of the NICE cost effectiveness threshold. 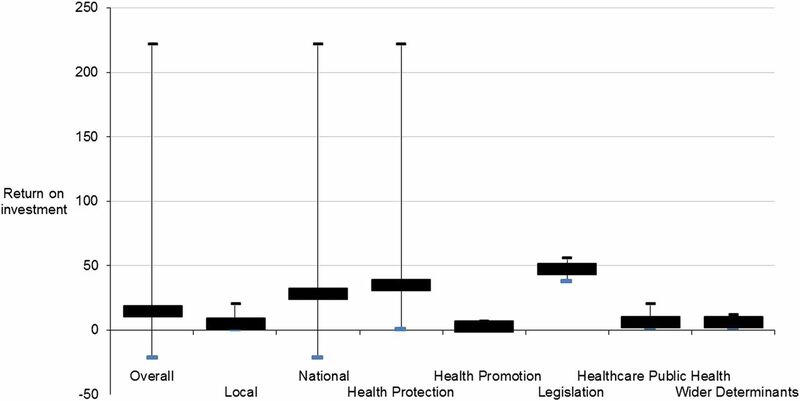 Health Technol Assess 2015;19:1–203, iii–iv(cited 20 January 2017).
. Quantifying health impacts of government policies. London: Department of Health, 2010. (cited 20 January 2017) https://www.gov.uk/government/uploads/system/uploads/attachment_data/file/216003/dh_120108.pdf .
. Assessing Cost-Effectiveness in Prevention (ACE-Prevention): final report. Melbourne: University of Queensland, Brisbane and Deakin University, 2010.
. Economic analysis of a community-based falls prevention program. J R Inst Public Health 2006;120:742–51.
. Cost effectiveness of stop smoking services in Wirral: 2015 update. UK: Wirral, 2015.
. Cost benefit study of school nursing services. JAMA Pediatr 2013;5441:642–8.
. Lifetime effects: the HighScope Perry Preschool study through age 40. (Monographs of the HighScope Educational Research Foundation, 14). Ypsilanti, MI: HighScope Press, 2005.
. Standardizing methodologies for economic evaluation in health care: practice, problems, and potential. Int J Technol Assess Health Care 1993;9:26–36. Contributors RM drafted the paper, conducted the literature search, assessed the methodological quality of included studies and conducted the analysis. EA independently conducted the systematic review and assessed the methodological quality of the included studies. BC adjudicated in any disagreements in the methodological quality assessments, provided health economics advice and assisted with the data analysis. RC provided expert health economics advice and support throughout, and made significant contributions to the analysis and manuscript. SC devised the concept, supervised the project, provided expert public health advice and support throughout, and made significant contributions to the analysis and manuscript. All authors made substantial contributions to the analysis and manuscript, including final approval. Funding RC is supported by the National Institute for Health Research (Senior Research Fellowship, SRF-2013-06-015).